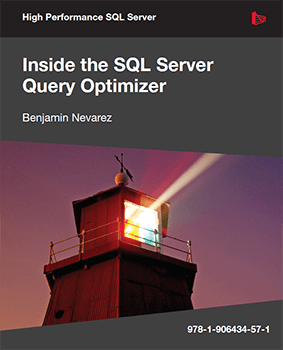 Write fast, efficient SQL queries with key insights from Benjamin Nevarez's book 'Inside the SQL Server Query Optimizer' and effortless assistance from SQL Prompt. Understanding what happens inside the SQL Server Query Optimizer will guide you in creating superior queries and help you boost the performance of your databases and applications. Then pick up your free trial of SQL Prompt to put into practice what you learn. SQL Prompt is crammed with features to make writing, editing, and exploring database code effortless, leaving you to focus on the clever bits. You can concentrate on writing efficient, optimized code, and leave the routine work to SQL Prompt.